First Nations Child Welfare Case: Does Ottawa Discriminate? OTTAWA - Systematic under-funding of child-welfare services on reserves means First Nations children today are essentially re-living the residential school nightmare that brought Canada so much shame, says the national chief of the country's largest aboriginal group. Shawn Atleo of the Assembly of First Nations told the Canadian Human Rights Tribunal on Monday that many reserves don't have the wherewithal to keep children safe and in their homes when their families go through a crisis. Instead, the children are being sent into institutional care by the thousands, he said. "Our children keep being taken away from First Nation families on reserve perhaps in even greater numbers today than during the residential school era," he told the tribunal on its first day of hearings into First Nations child welfare. "It's a pattern that looks a lot like the pattern under residential schools," he added in an interview. While exact totals of First Nations children in institutional care are impossible to come by, the AFN and experts estimate there are at least 27,000 aboriginal children who have been removed from their immediate families. That's easily double the number forced away from their homes and into residential schools during the late 1940s and '50s — a brutal period that still haunts First Nations families. "The reasons for the removal today are different and relate more to poverty and social conditions on reserve," Atleo said. "The removal appears not be driven directly by an intention 'to kill the Indian in the child' but the consequences are nonetheless the same." Nowadays, the discrimination is not as explicit as it was decades ago, he added in the interview. But families are falling apart, communities are losing their culture and language, youth are going to jail and the cycle of poverty is well entrenched, he said. "This is very personal for all of us." The tribunal is trying to determine whether the federal government discriminates against First Nations children in the provision of child-welfare services. It's a case that could have repercussions not just for families and the Finance Department, but possibly also for federal funding of First Nations education, policing and health care. The hearings are a culmination of seven years of legal wrangling. The AFN and the First Nations Child and Family Caring Society started legal action against the federal government in 2007, arguing that child-welfare services on reserves received 22 per cent less funding than off-reserve services, even though the need was far greater. "This case strikes to the conscience of the nation," said Cindy Blackstock, the executive director of the family caring society. Ottawa has argued that the case should not be heard at all because it's not fair to compare federal programs to provincial programs. Federal lawyers continue to pursue that argument in the Federal Court of Appeal, with a hearing set for next week. Federal officials also say they have been putting more money into First Nations child welfare and reorienting their programs to focus on keeping families together. They say funding has risen by 25 per cent since 2007 to $618 million in the 2011-2012 fiscal year, with a large of chunk of the new funding put towards prevention. 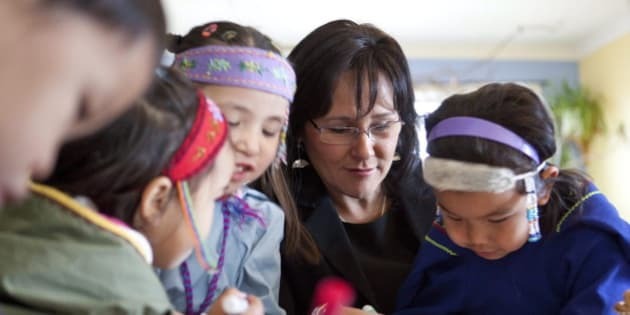 "We actually believe that the best way to ensure First Nations children and families get the support they need is by working together with First Nations, provinces and territories," government House leader Peter Van Loan said in response to a Commons question about equal funding. "We're doing that to ensure, most of all, that we benefit First Nation Canadians by having a strong economy and by creating the educational and economic opportunities for them to succeed and advance,"
But the tribunal heard on Monday that even as the federal government tried for years to quash the human rights case on a technical basis, government officials also deliberately sought to undermine Blackstock, who has become the public face of the child welfare dispute. "You'll also hear evidence about how Dr. Blackstock was essentially stalked by the respondent," her lawyer, Paul Champ, told the tribunal. He said he will show over the course of the hearing that the government monitored Blackstock's personal Facebook page, scrutinized all her speaking engagements and refused to meet First Nations leaders who were working with her. Champ said he will also show how the treatment of First Nations children today is part of a long, troubling history of Canada accepting lower standards for children based on their race or ethnicity. "It's one single continuum," Champ said in his opening statement. "What is the same in the pattern, is the acceptance of the federal government and the respondent that First Nations children can be treated differently. That it's acceptable that a lower level of services can be provided." That acceptance created the residential school system of the past and is allowing the disparity in child welfare to persist today, he said. "The disparity may not be as large but the evidence will absolutely show that there is a disparity." A spokesman for Aboriginal Affairs Minister Bernard Valcourt declined comment on the case. "Canada refutes the personal allegations made by the plaintiff and will not comment further on this particular issue," Jason MacDonald said in an email.